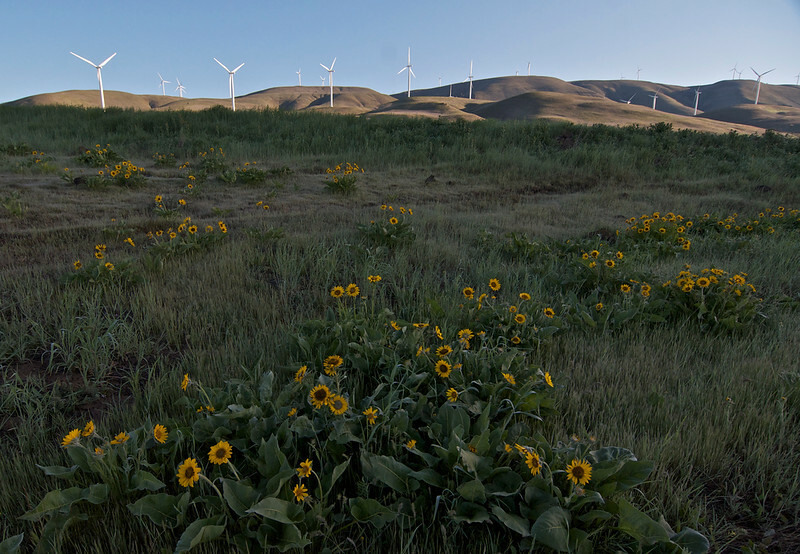 4/22/12 Was in the Columbia Gorge this weekend where there are extensive wind farms on the hills and plateaus above the river. This time of the year the Gorge is a vivid display of wildflowers which seems a fitting complement to these alternative energy sources. Mule ear's, Wyethia sp. are shown here. Happy Earth Day. I like wind power just don't really care to see the wind mills! I guess that's like haveing your cake and eating it to! Aleast it's an effort to create clean energy, was hoping they would invest a little more into researching clean burning coal solutions and put some familys to work in coal Mountian Towns of the Appalachian Mountains along the east coast of the U.S.! Beautiful capture of wild flowers!